Nowadays, there are a variety of materials to use in cheekbone surgery, and there are many shapes to choose as well. Cheek Augmentation is to adjusting level of cheekbones for people with low cheekbones and narrow, to be more tall and broad. This will make middle face to be more balance and more sweet/female face. Doctor will open incision inside mouth at around above lips, or incision at around under lower eye lashes. Then, doctor place trimmed silicone on cheekbone. After that, doctor suture with dissolve-able stitches. The surgery takes about 1-2 hours, with general anesthesia or local anesthesia. 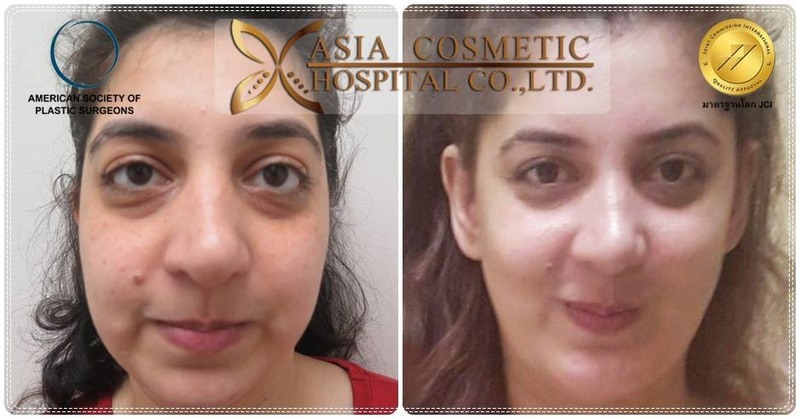 Cheek Augmentation, doctor will place the extra material on the cheekbones, and after surgery, there is more swelling than Rhinoplasty and chin augmentation. 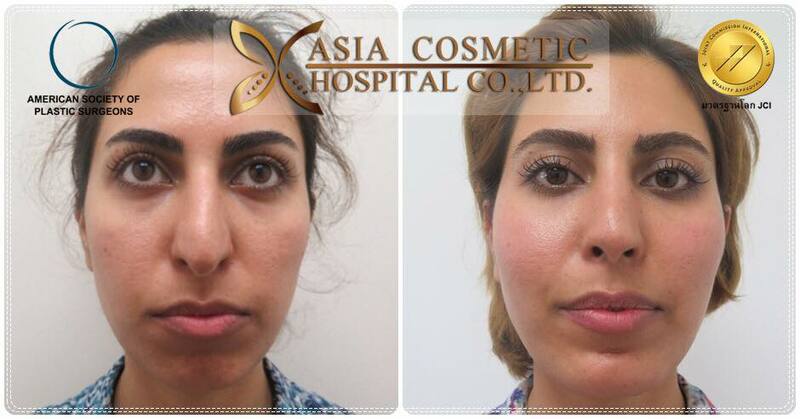 Cheek Augmentation is suitable for those with low cheekbones, and want to increase the width and height of the central face. Technique 1 : Surgery has scar in the mouth without external scar. Technique 2: With under eye lesions same as lower eye surgery. This way the scar will stick to the lashes. 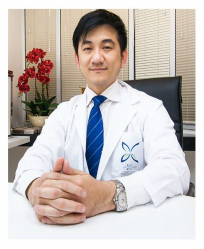 Which is same as lower eyelid surgery. Technique 3: Fat injection by liposuction from the abdomen. Technique 4 : Collagen Injection. Here will explain about Technique 1, and Technique 2, because it is often used. Use your own bones is not popular, because of they have to have other surgery to remove the bone – another scar, for instance a rib, waistline or head. Use calcium. (HYDROXYAPATITE) is better attached to the tissue than the silicone. But it is harder to sharpen and remove. It is less popular. Polymers such as silicone is currently very popular. Because it is easy to use The sharpener is simple, easy to remove and no harm to the body. 1. Avoid aspirin painkillers and any drug in this group for 10 days before surgery. should inform the doctor as it may stop eating herbs before surgery for 3-5 days. 3. If you have a medical condition, let the doctor know. 5. Tell your doctor about your condition, Such as diabetes, heart disease and allergic medicine such as penicillin, sulfa, etc. 6. Should be prepared to bring a pair of sunglasses. To camouflage eyes after surgery and dust protection. Should have a driver. Because after surgery, it is not easy to use the eyes. So do not drive yourself. 7. Wash your face before surgery. 8. Atherosclerosis requires aspirin or people with heart disease and take Cumadin regularly. The surgery can be performed only when the physician agrees to do so, and must perform surgery only in the hospital. 9. Those who use a heart stimulator should not undergo surgery. Because the electric pacemaker may affect the function of the pacemaker. 10. If there is high blood pressure. Need to control less than 140/90 mm Hg (mm Hg) before surgery. 11. If patient put on contact lenses, patient should be removed and then put on glasses on surgery date. 12. Take a friend to help take care home. 3. Put the silicone supplement in the desired position. 1. For technique 1, do not need to remove stitches, because of using dissolvable-stitches. 2. For Technique 2 will remove stitches about 5 days after surgery. 3. Attach cool water under the eyes, during the first 2 days after surgery. By putting ice in a clean plastic bag. Then cover with a clean towel again. Used to relieve swelling and help prevent hemorrhaging or internal fluid. 4. Should sleep high head. To keep blood after surgery from running out of the body. This is to prevent blood from accumulating to cause the swelling to collapse slowly. 5. Take antibiotics and swelling as prescribed by doctors. If pain can take painkillers. 6. Patient can eat anything except spicy food for 7 days after surgery. Because it will increase blood pressure. May cause bleeding from the wound. 7. Should not drink alcoholic beverages. Because it will expand blood vessels. There may be bleeding and it will slow down the swelling. 8. Should not smoke, because it will shrink blood vessels. May cause bleeding to the wound is not easy. 9. Can work normally. However, it should be abstained from work or intense exercise 7 days after surgery. 10. Should not use eyes much after surgery. Because of the use of sight, such as watching TV or reading. Blink and eyelids must be constantly moving. May cause inflammation and slow heal. 11. If you wear contact lenses. Should change to wearing glasses instead of the first week. Or until it not swollen. And do not pull the eyelids to wear contact lenses. Because it will make the surgical wound stitched open separately. 12. After 3 days surgery, you will begin to wash your face regularly. And use warm water or clean water. To clear stains of bleeding. 13. To clean the area of ​​the wound of eye ulcers. This can be done by using a cotton pad moistened with warm water and gently wiped on the eyelids. 14. Can make up and tear the eye normally. After surgery, about 1 – 2 weeks. 15. After surgery for about 5 days, go back to the doctor to remove stitches. 16. Do not rub eyes severely 3 weeks. 17. Make another appointment at 3 weeks, but if no abnormal symptoms. May not meet doctor.